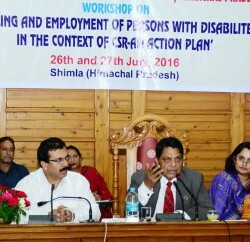 Col. Dr. Dhani Ram Shandil, Social Justice and Empowerment Minister said that the present Govt. had given special emphasis on upliftment of needy and poor sections of the society, so that they could live respectable life. He said Rs. 1371 crore were being spent on social security services during current financial year, which was 34 percent of total State Plan. Social Security pension has been enhanced to Rs. 500 and all 10900 pending pension cases were approved, after coming to power. 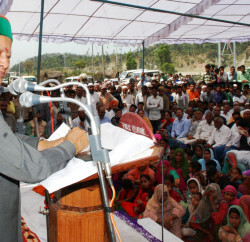 He said it while presiding over the district-level Independence Day function at Solan. Dr. Shandil said that financial assistance under Rajiv Gandhi Awas Yojna and other State Awas Yojna has been enhanced from Rs. 48500 to Rs. 75000. He added that 10,000 houses would be constructed during this financial year for houseless poor families in the state. Referring to Solan district, he said 11573 persons were getting social security pension and Rs. 7.46 crore were being spent on it. He said all 211 panchayats had been connected with link roads and district has a road network of 2602 kilometers. 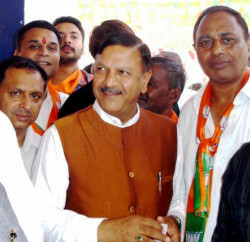 Former MLA Major Krishna Mohini, Chairman Nagar Parishad Kul Rakesh Pant, Gen Secy HP State Congress Committee Vinod Sultanpuri, President District Congress Rahul Thakur, Chairman Solan Marketing Committee Ramesh Thakur, H.P. Tourism Board of Director Surinder Sethi, Kirti Chakar winner Col. Kanwar Panwar, Deputy Commissioner Solan Madan Chauhan, representatives of PRIs, officers and prominent persons of the city were also present on this occasion. At district-level Independence Day function at Nahan Vinay Kumar, Chief Parliamentary Secretary presided over the function and while addressing the gathering he said that the State Government had given top priority to connect every village of the Pradesh with road connectivity. He said that a sum of Rs. 2291 crore were being spent on road and bridges in the state during current financial year, besides 475 kilometers long new roads and 35 bridges to be constructed during this financial year. Earlier, he also offered floral tributes at Shaheed Memorial in Nahan town. Dr. Rajiv Bindal, MLA, Ajay Solanki District Congress President, Vikas Labroo, Deputy Commissioner, senior officers and prominent persons of the district were also present on the occasion.